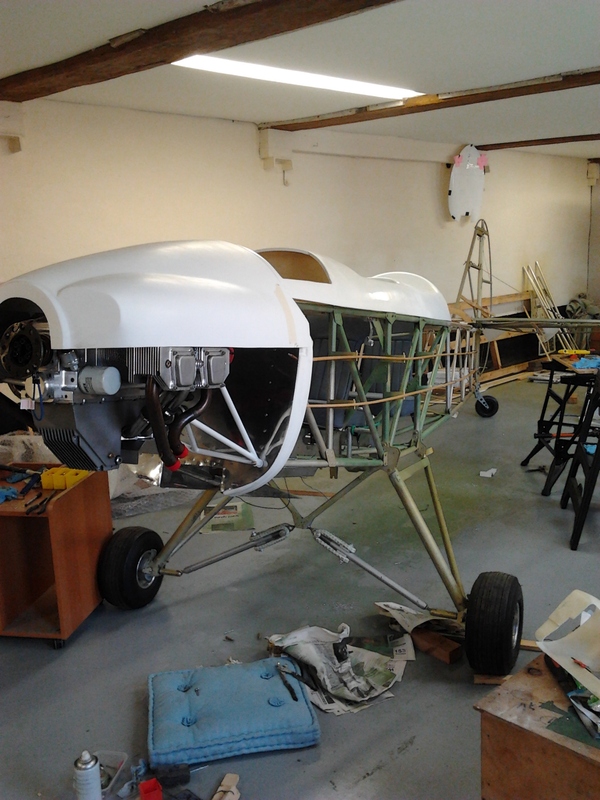 To save a treck up to the barn for every build item I have repositioned all the aileron parts to my garage roof ! 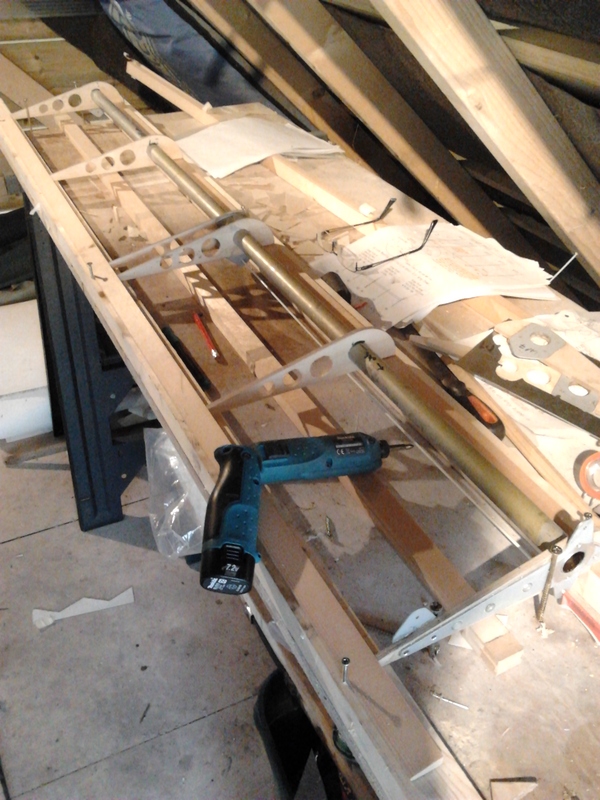 Now, with a jig built and a temporary rack setup so I can ensure I have a LEFT UPPER, LEFT LOWER, RIGHT UPPER, RIGHT LOWER ..
Having successfully cocked up my first two attempts at using the Nicopress crimper (kindly loaned by Channel Island Aero Services – you are a star Bob !) 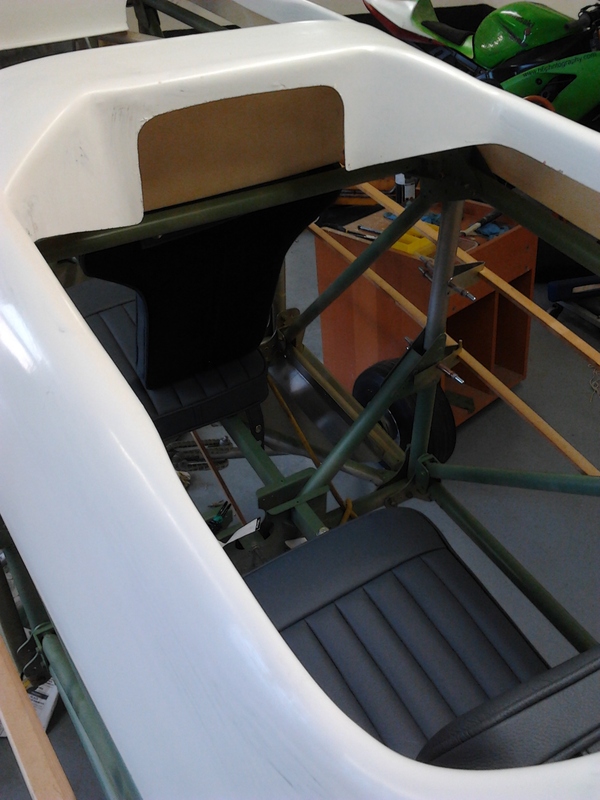 I finally got the hang of how much to leave as a ‘tail’ .. 64cm exactly between front (passenger) and rear (pilot) pedals .. so made a small jig ..
Heat shrinks yet to be heat shrunk ! 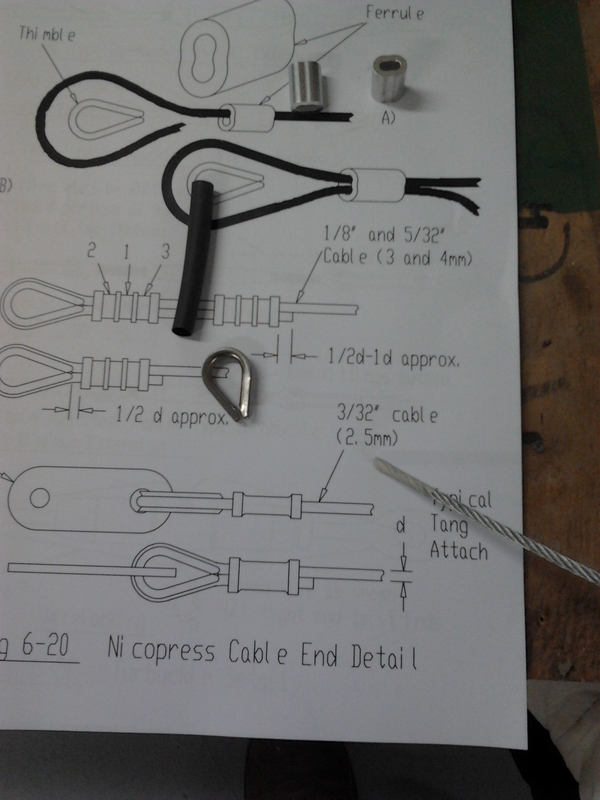 Cabling – A new Challenge and Learning ! When I was up at the TLAC factory in Norfolk last month Paul kindly stepped me through what putting a cable together entailed. First you wrap a short piece of masking tape very tightly around the cut point of the cable. When you then cut it doesnt fray all over the place. 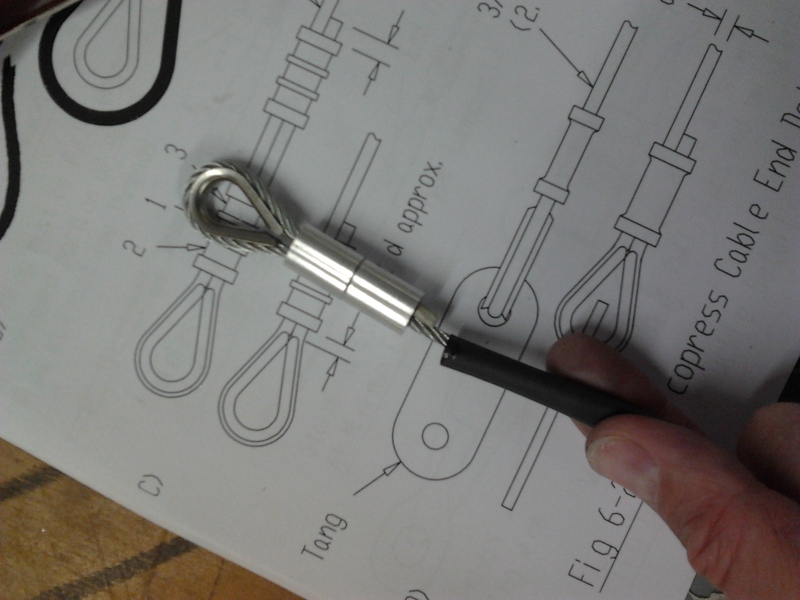 You then get your FERRULE and place it in the SWAGER (the device that compresses the ferrule onto the cable) passing the cable around the THIMBLE and back through the ferrule. 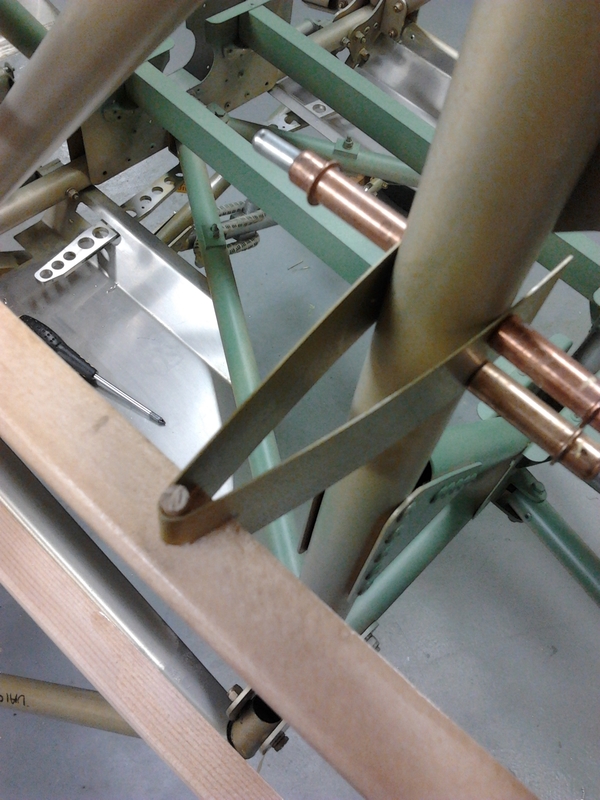 Pulling the cable through to adjust to length BEFORE clamping so you dont have to post trim. Take care to thread two ferrules onto the cable if it calls for it PLUS the heat shink cable – difficult to slot on afterwards ! After the first press (in the middle) you remove, turn through 180 degrees and compress again. Then you do the same one end and then the other. This ensures you have an even grip over the length of the ferrule. Not posessing a swager – South Pier Ship Yard have kndly offered to let me use theirs (very many thanks Ed !) who has shown me some of the very neat job he does on their boat cables. 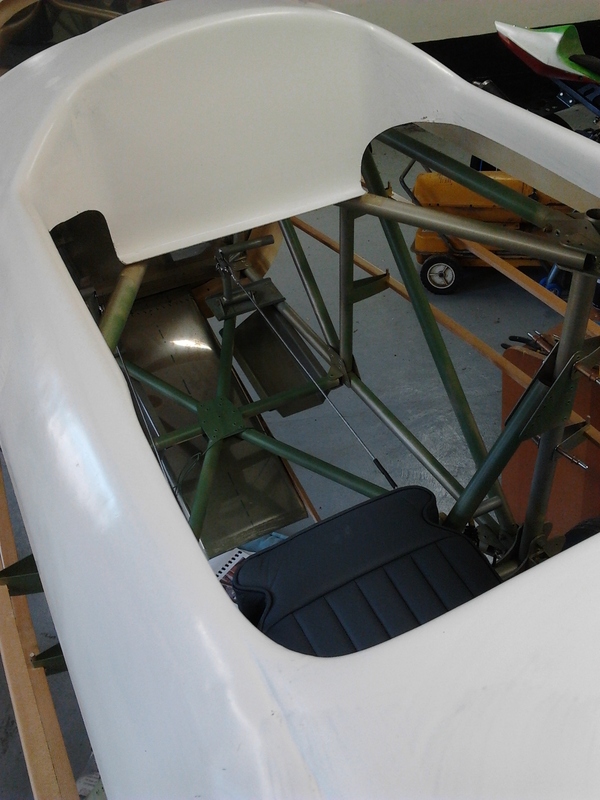 First step will be to accurately measure the point to point between the front rudder pedal and the pilot rudder pedal – as these are the first I will try. As Ed suggested, mark where the cable ‘peaks’ over the Thimble. Why is it taking so long ! This is always a difficult question .. you are constantly having to learn new things and so estimating something that you have never done before is not a particularly exact science ! Also, if you are sensible, and pay attention to the small details .. you end up walking away from the barn with a satisfied feeling … although there have been times when that rivet that didnt sit flush … nags away at you and there is no alternative but to carefully remove it the next day and GET IT RIGHT ! The ‘Small stuff’ like rounding the corners of every sharp edged or square edged item by cutting, filing, then smoothing with emery which then removes the initial etch prime – so you have to touch up all takes time. But they jump out at you when they havent been done ! 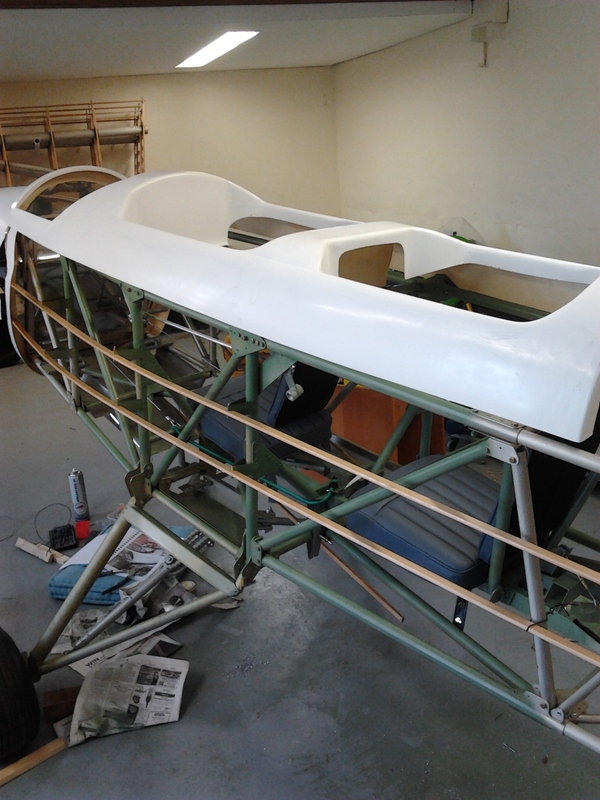 Stringers – the 2 long ones on each side are in and brackets being shaped – need to fit to front end, taper at rear. 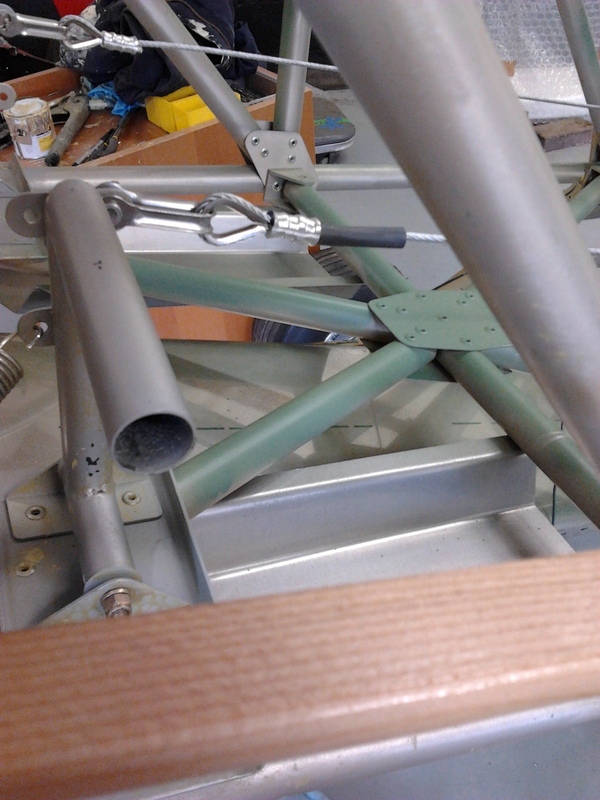 Belly stringers will be riveted in place once exhaust duct is filed smooth. So lots of things running concurrently to keep me busy ! The stringers are long bits of beech or spruce that run alongside the body and change the shape from a boxed off section to take the curve of the material/covering. Preparing the stringers takes around 2 hours each to round of the edges, then treat with 50% thinned polyurethane nefore another sanding, then final coat of full 100%. 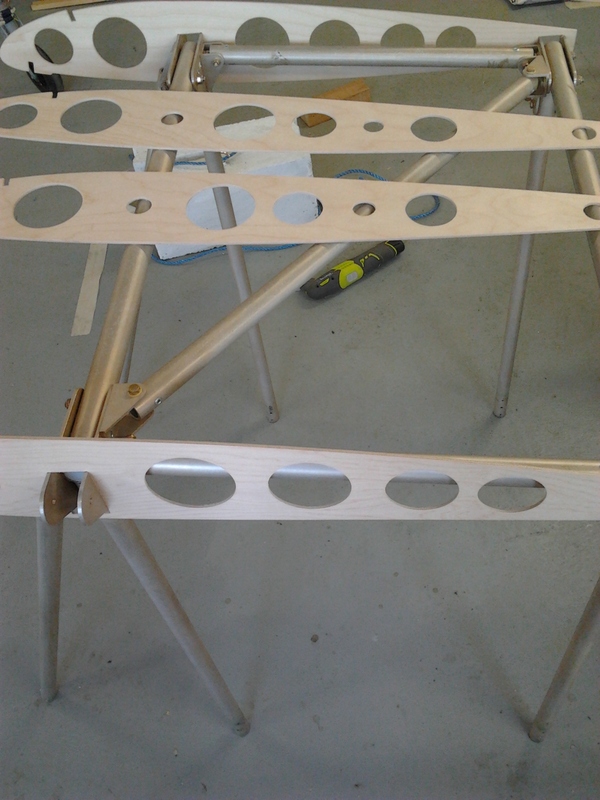 They then slot part way through the ‘V’ and simply peg with a dowel – neat and simple ! 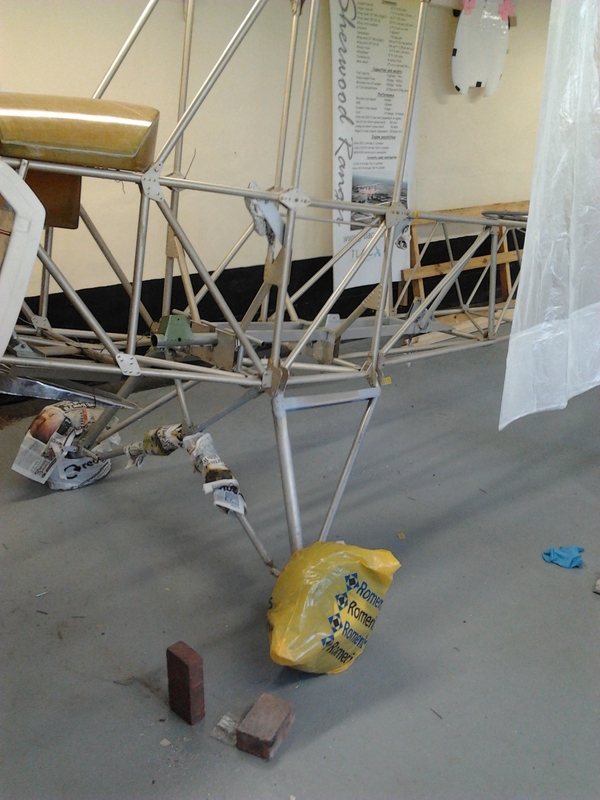 Managed to borrow a nice chunky engine hoist (thank you Mike Fleming .. a star !!) 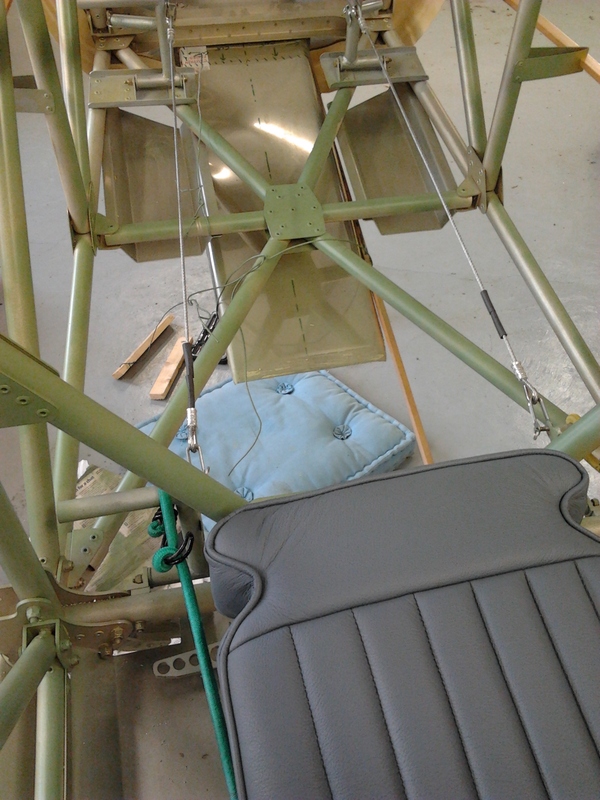 .. spent careful time placing heavy duty strops under the engine in the crate so that no key part would be crushed or bent as the lift took the strain. 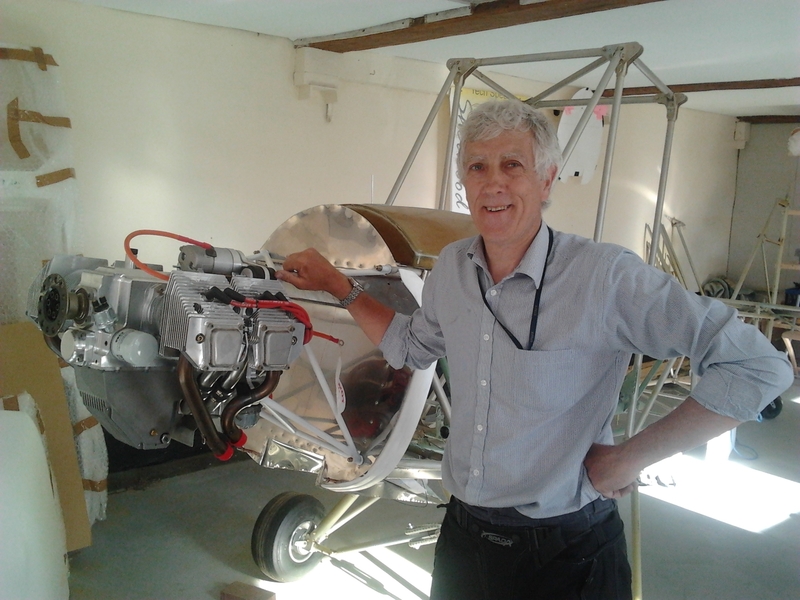 Three of us (Will, Keith and I) managed to get the engine swung into position – eventually remembering the lower rubbers have a metal spacer washer on first ! Fits onto the TLAC supplied cradle very neatly. I can’t quite locate the stainless exhaust onto the stubs and dont want to push and pull the exhaust outlets without skill associated with that sort of day job ! 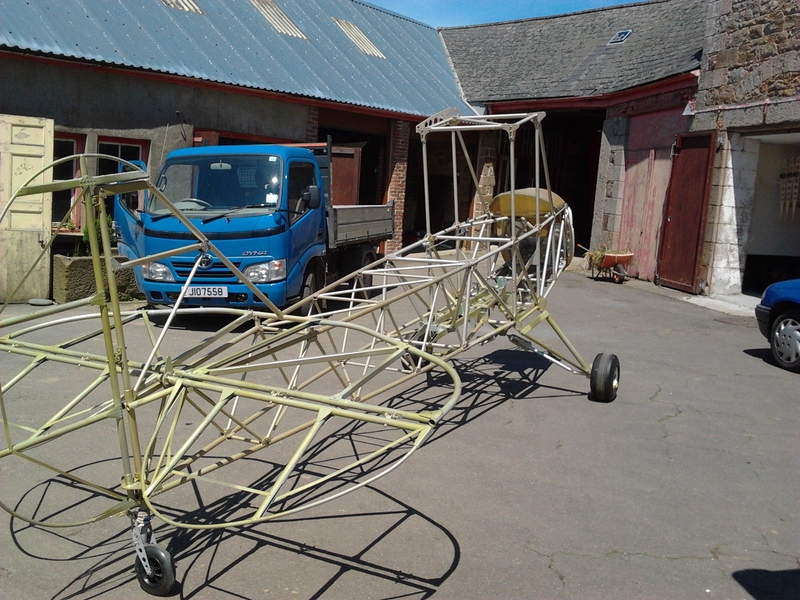 Hopefully I have a friend at Channel Island Aero Services that will cast his expert eye over this. Have temporary full length thread bolts for now but Paul at TLAC is sourcing proper engine bolts with thread only as the bolt leaves the male/female bungs and facing mounting washer.